Extra! Extra! Read all about it! Bronze statue of a photographer comes alive and walks! 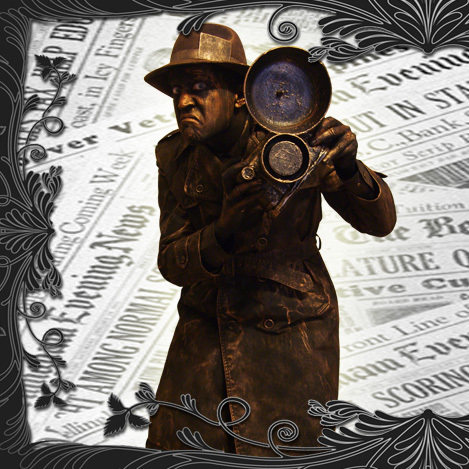 Have your photograph taken with The Living Statue Company's statuesque snapper - The Bronze Paparazzi. What a scoop! This guy has got pictures to take and he doesn't care where he shoves that camera. Looking just like a real bronze statue your guests will be impressed by your tasteful choice of sculpture - but when they get too close he comes alive with a flash! His real flashing camera never stops searching for the perfect shot - who knows what might develop? The only pictures this human statue gets are of guests jumping in fright then falling about laughing but that won't stop him and his candid camera.